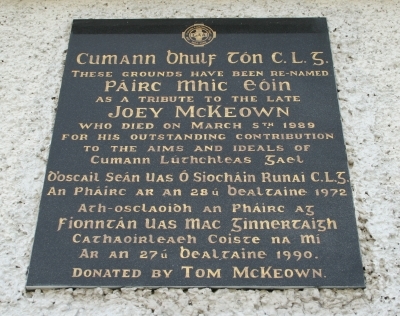 How appropriate that the Kilberry grounds should be renamed in honour of Joey McKeown. Different people will have different memories of Joey but sports reporters in Meath will remember him as one of the very best P.R.O.’s in the county. Joey’s regular Monday visits to the offices of the local papers, during his lunch break at Navan Carpets ensured that the activities of the Wolfe Tones Club were not swept under the carpet. He was also a keen photographer and much of his work appeared in the papers. He could be totally depended on as regards match details being supplied. So devoted was Joey McKeown to the upkeep of the Kilberry grounds that it was sadly appropriate that he should see his last game of football there. No doubt, Joey is here in spirit this evening to see further improvements to a Park to which he contributed so much. Gaelic Football has been a big part of my life and I would like to briefly make a few comments about it in my scrapbooks. Although I have been living in Rathkenny parish for the past eighteen years, my football parish is Oristown and as you can understand I got all the scraps I can for this parish but particularly the Kilberry end of it. I was born in Kilberry, I also cover as much of Meath as possible and the rest of the country plus some world scraps. I started my football career with Kilberry in 1946 as a member and I played football with Kilberry from 1947 until 1962. My big disappointments were that I did not get a chance to play football until I was eighteen years of age, that I failed to win a Championship medal and that Wilkinstown did not win a hurling title. My football commitments were to Kilberry G.F.C., St. John’s G.F.C., Kilberry, Wolfe Tones G.F.C. Oristown, Navan County Board G.A.A. and in hurling to Wilkinstown H.C. My greatest moment was when St. John’s G.F.C. Kilberry won the intermediate championship (football) in 1974 , other great moments for me were, when Garryownen G.F.C. and Kilberry G.F.C. joined forces to form St. John’s G.F.C. 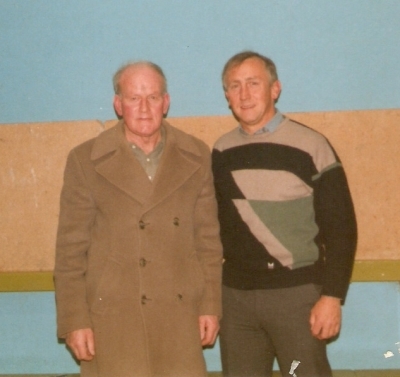 Kilberry in 1973, when Gibbstown G.F.C. and St. John’s G.F.C. joined up to form a parish team Wolfe Tones G.F.C. Oristown in 1975, the official opening of the grounds at Kilberry in 1972, Kilberry winning the minor championship of Meath in 1955 and 1957, Kilberry winning the junior “B” championship in 1963, the Kilberry grounds for winning the award for “The Best Kept Grounds in Meath” under St. John’s G.F.C. in 1974 and under Wolfe Tones G.F.C. in 1976 and 1978 and all Meath teams successes down the years. I suppose one way of describing my scrapbooks would be The Good, the Bad and the Ugly, also some of the saddest of life and like all news reporters the controversial. I have taken great care to have the dates in my scrapbooks in right order. In my time I would say Meath’s best all round footballer was Peter McDermott, my best County Board Chairman was Colm Cromwell, my best County Board Secretary was Liam Creavin and my best Referee was Tommy Million. My first All Ireland Final was in 1946, Kerry v Roscommon, one man on that Roscommon team was Donal Keenan. 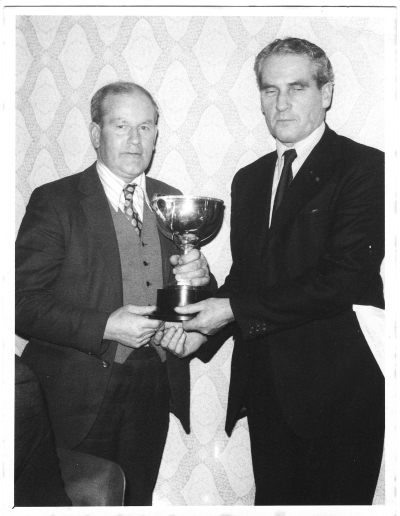 In 1974 as President of the GAA he was a guest at the Meath GAA Dinner Dance and Presentations in Athboy and he presented me with the intermediate championship medals. To all the reporters down the years here are some of them, Garrett Fox, Noel Coogan, Jack Fagan, Tom Mooney and Jack Lynch. I say well done. Also to my wife Julianne and son Oliver who helped me a lot to collect my scraps. I cannot forget the photographers back through the years, my old friend J.A. 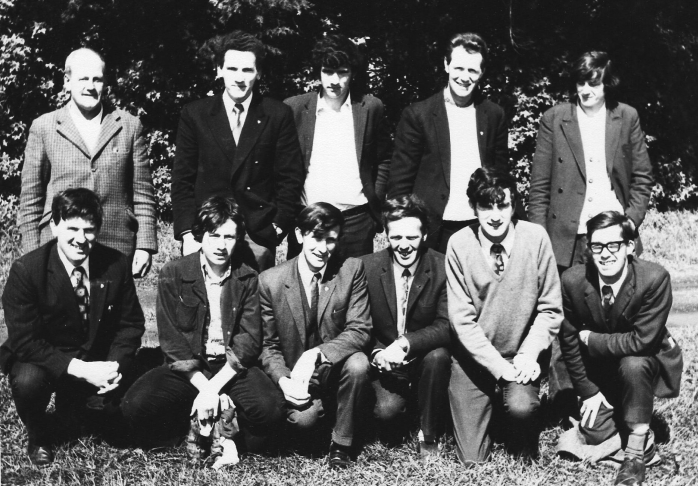 Clarke of Kells, Gerry Delaney of Navan, Hugh Brady of Dundalk, J. Carney of Navan and J. McKenna of Navan. Although Kilberry is situated in the central area of the county, its football tradition is more akin to that of North Meath. In the early days of the Association, Kilberry was not as prominent as neighbours – Rathkenny, Castletown, Martry and Syddan. Nevertheless, Gaelic Games have a long tradition in the area. Unfortunately, available records do not contain information about the early part of the century. One of the oldest inhabitants, Paddy Gilsenan, remembers a Club being formed in Kilberry in 1908. According to Paddy, this was a revival of an older Club that had flourished in the late 1880’s and 1890’s but had lapsed for a few years. Kilberry teams at that time were popularly known as the “Stars and Stripes”. The name derived from the very distinctive jerseys worn by the team. Paddy Gilsenan recalls these jerseys being bought for the 1908 team. A local man called Joey Cully had one of the old jerseys worn by the 1880 side. The new jerseys were similar to this. The official name of the Club at this time was St. John’s. With the exception of a few years before 1918, there was a Club in Kilberry down to 1937. Whatever about the earlier period, from the early 1920’s Kilberry occupies a prominent place in these records. There is a notice of a tournament game between Kilberry and Castletown at Cross Guns on Easter Sunday 1924. The “Meath Chronicle” contains a notice of the Annual General Meeting of Kilberry Club on Sunday, March 22nd 1925. A list of the attendance at meetings of Meath County Board during these years regularly contains the name of C. Allen, Kilberry. In 1929, there is mention of a team in Wilkinstown for the first time. The Wilkinstown team seems to have continued in existence for at least a few years. Twice during these years Kilberry and Wilkinstown met in the Junior Championship and on both occasions, Kilberry were victorious. In October 1929, there is a report of a Junior Divisional Final between Kilberry and Kilbeg. The score was Kilberry 2-2, Kilbeg 1-1. 1931 seems to have been the year of controversy for Kilberry Club. In the first round of the Junior Championship, they met and defeated Kells, but lost the match on an objection. The decision was reversed on appeal to the Leinster Council. The same two teams met later in the year in the semi-final of the Championship and in another controversial encounter, Kells were victorious. A Meath Junior team to play Louth in 1931 includes the names of James McKeever and P. McHugh, Kilberry. In 1931 a new development appears – the “Meath Chronicle” contains a notice of a meeting of the Kilberry Hurling and Football Club on Sunday March 8th. This is the first mention of hurling in Kilberry. In the draw for the Junior Hurling Championship the same year, Kilberry were paired against Rataoth. The hurling team was short-lived, however, and seems to have lasted only one year. Hurling was again played in the area in the 1950’s when a hurling club was founded in Wilkinstown – it flourished for a few years but the task of promoting hurling in the area proved a difficult one. 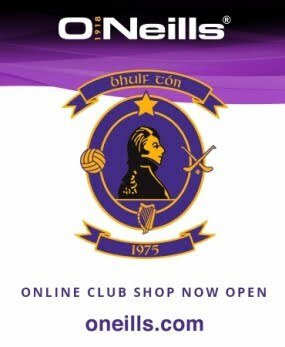 The Club went out of existence in 1970. 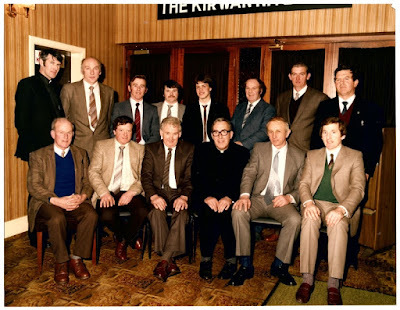 For two years in the 1960’s a football team was also entered by the Wilkinstown Club, but this was dropped and football was again concentrated in Kilberry. To revert to the earlier period, the late 20’s and 30’s seem to have been the most successful years of the old Kilberry Club. During the next few years interest seems to have declined and in 1937 the club went out of existence. For the next ten years there was no club in Kilberry, but during part of this time, about 1940 to 1945, the Wilkinstown club was revived and it catered for football in the area. The Kilberry club was reformed in 1947. Preparations had been going on since the previous year for the formation of the club. A group of young men from the parish were member of the local unit of the L.D.F. This group formed the nucleus of the new club. The Committee was headed by James McKeever as Chairman, and the late Michael McHugh as Secretary, and a team was entered in the 1947 Junior Championship. From the beginning the team was a strong force in the Championship, only to be beaten by Kells. In the following year, the team alternated between junior and intermediate grades. In 1955 and 1959 they reached the Junior Championship semi-finals, but were beaten by Carnaross and St. Patrick’s respectively. In 1963, they won the Junior “B” Championship, but failed to Drumconrath in the final of the Junior Championship proper. In 1965 and 1970, they again reached the semi-final of the Junior Championship, but failed to Donaghmore and Rataoth. Meath County Board Dinner Dance and Presentations 1974 held in the Kirwan Arms Hotel, Athboy. 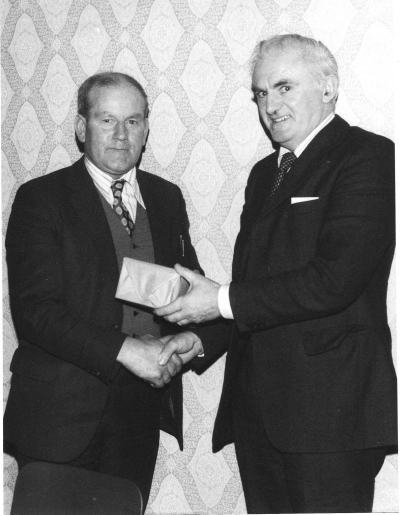 Dr. Donal Keenan, Roscommon President of the GAA presenting Joe Mc Keown, Vice-Chairman St. John G.F.C. Kilberry with the Meath Intermediate Championship medals. From the beginning, special attention has been paid to the promotion of football among the boys of the area. Under-age teams have been entered in all competitions and these are run on a parish basis, in co-operation with the Gibbstown Club. A team has been entered in the Juvenile Championship since its inception. Two of these teams had the disappointment of being beaten in the championship final. This was in 1952 and 1953 and Ballivor were the victors on both occasions. The only successes by club teams were recorded in the minor grade – they won the County Championship in 1955 and 1957. “Rev. Fathers, Ladies and Gentlemen, on behalf of St. John’s F.C., Kilberry, I wish to welcome you all here tonight to our Dinner Dance and Presentations. This has been a very historic year for the Club. Along with winning the intermediate championship and two tournaments, we won the award for ‘The Best Kept Grounds in Meath in 1974’. Firstly, I will say a few words about winning the intermediate championship. A lot of people said we were very lucky. Well, I will be the first to admit that we had luck, but I will go on to say that a team makes its own luck. Down the years were so unlucky, if we had some luck this year it was long overdue. Our first game was v St. Marys and it was a very good one. We won by nine points but not nearly as easily as the score suggests. In the second round we had to face the previous year’s beaten finalists, Moylough. We knew this would be the big test and we weren’t wrong. It was a titanic struggle, with us just winning by a point. In the third round v Oldcastle we probably played our best football of the year. It was very hard early on, but midway in the second half we got on top and won easily in the end by seven points. Ballinlough were our next opponents in the fourth round and they gave us a really hard game. We struggled to win by five points. We were not at all pleased with our display in the fifth round v Kilmainhamwood. Maybe it was because we were already through to the quarter final, still, we were very disappointed. We defeated Kilmainhamwood by five points. At this stage of the championship we knew the team had gone off form, so we decided to hold a tournament, the final to be played at our sports. We reached the final of this tournament and our opponents were our old friends from Dublin, St. Brendan’s. It was in this game that we got a real run around. We had met nothing in Meath like St. Brendan’s. They were just brilliant and I am sure we must have learned a lot from this game. St. Brendan’s are well represented here tonight and I would ask you to give them a big hand. If we were counted lucky this year, St. Brendan’s must be counted very unlucky as they have been defeated for the third year in the Dublin intermediate final. I will say to St. Brendan’s ….. keep trying, you must win it. Meath County Board GAA Dinner Dance and Presentations held in the Kirwan Arms, Athboy. Pat O’Neill, Chairman Meath County Board presents the award for Best Kept Grounds in Meath for 1978 to Joe Mc Keown, Wolfe Tones GFC, Kilberry. In my opinion, our near neighbours, Gibbstown helped us a lot to regain our lost form. We played them at their sports for a set of medals. We won and you could see the confidence coming back to our team. The following Sunday was the big one v St. Brigid’s in the quarter final. This was a game in which you could see great character, spirit and determination in St. John’s. After a very bad start in which we were seven points behind, we fought back point by point to win by a solitary point. In the semi-final our opponents were Rathkenny, our near neighbours and I can safely say we did not relish meeting each other. In a tension packed game we just beat them by 0-6 to 0-3. Frees 30 to 40 yards out to be taken by Liam McMahon. Tom O’Donnell to start taking frees around the 50 out to centre field. Peter McKeever to take some of these frees. With these long range frees have a go for a point if you can, if you think you can put it over. Frees on right side of defence to be taken by Jim Smyth, left side of defence Michael Geraghty or Gerry Clarke. Kick out from goal Michael Geraghty and to Michael change your kick out if necessary. Sean Duffy to relieve you if need be. Penalties to be taken by Jim Jim Smyth. To the backs, never be drawn out of position, meaning don’t let your man inside your centre field, one of you go up for the ball, the other watch the break as much as possible. Make sure your man does not run loose into our defence. To the forwards, wing forward keep spread out, try and send the right kind of ball into Paddy McKeever. To all players, to the whole team, make the ball do the work, no unnecessary short passing, try and find your man 40 or 50 yards away in other words kick the ball when you get it. Do not shout for the ball unless you are well placed. Tackle and harass your opponents like hell. The referee, accept his decisions, say not a word to him. No late tackling. Remember, umpires and linesmen can tell the referee what goes on behind his back. Do not give out or argue with each other, encourage and urge each other on at all times. This game is just for sixty minutes, go out there with all the spirit and determination you can muster and keep it up for every minute of this game. This is your chance of a lifetime, go out there and take it. We got off to a great start in the final. I guess you could say Vincent's never really got going. Still, from our point of view, there never was enough in it for comfort. We were in front by four points at the final whistle. Well, as far as I was concerned and everyone else around Kilberry it was out “Dream of a Lifetime Come True”. I would like to congratulate St. Vincent’s on the very sporting way in which they accepted defeat, also all the teams we met during the year. Before I leave the final I would like to thank the lady who stitched the sleeves of some of the jerseys. This caused a good deal of fun and laughs and curses but anyway, it helped to take some of the tension away. 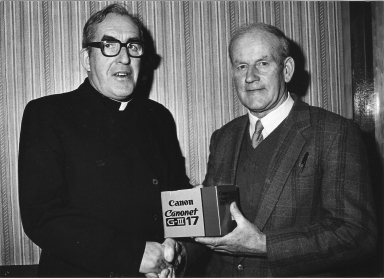 The winning of the award for the Best Kept Grounds in Meath for 1974 was a great achievement. At the beginning of the year we knew of this award and we decided to “have a go” and there was great jubilation when it was announced at the Meath County Board Dinner Dance that we had won it. I would like to thank very sincerely those who worked so hard last year and particularly back through the years, to make our grounds the best kept grounds in Meath for 1974. I hope that there will be a big effort to retain this award in 1975. Colm Cromwell says so anyway! Father Larry Bannon P.P. 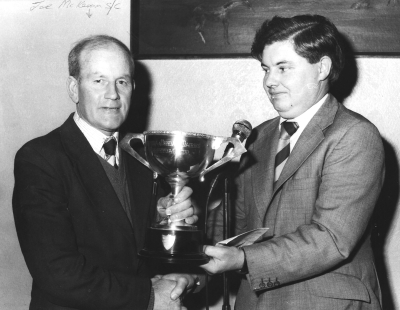 Oristown presents the Clubman of the Year Award for 1984 to Joe Mc Keown at the Wolfe Tones GFC & HC Dinner Dance held in the Kirwans Arms Hotel, Athboy.